Do not run out of your discount code Cross! 22-04-2019 A.T. Cross LIMITED TIME OFFER! Get 20% OFF Selected Products and Outlet (Sale) Section with promo code at Cross.com! Exclusions may apply! This offer ends: 4/22/19 at 11:59 PM PST! 30-06-2019 A.T. Cross LIMITED TIME OFFER! Get Free Shipping and Free Personalization on All Orders over $49 promo code at Cross.com! This offer ends: 6/30/19 at 2:59 AM EST! 18-04-2019 A.T. Cross LIMITED TIME OFFER! 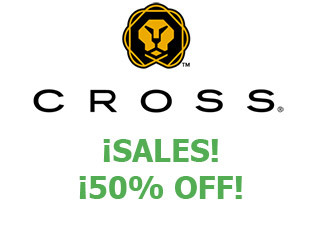 Get 15% OFF your purchase with promo code at Cross.com! Some exclusions may apply! This offer ends: 4/19/19 at 2:59 AM EST! 09-05-2019 Cross Tech3+ 23KT Gold Plate Multifunction Pen For $99 + Free Refill + Free Shipping And Free Engraving on All Orders. 23-04-2019 Cross 50% Off Outlet Sale. 40% Off Your Purchase Cross. Buy 1, Get 1 50% off Sitewide. A.T. Cross Get 20% OFF when you spend $100 or more + Free Shipping with promo code at Cross.com! This offer ends: 4/5/19! A.T. Cross GIFT SET! Get Tech3+ Pen, Refill and Clearing Cloth Set Now $39.99, was $89.99, with promo code at Cross.com! This offer ends: 3/29/19! A.T. Cross LIMITED TIME OFFER! All Star Wars Outlet (Sale) Products are 50% OFF, with promo code at Cross.com! This offer ends: 3/29/19! A.T. Cross LIMITED TIME OFFER! Get $10 OFF when you spend $50, with promo code at Cross.com! This offer ends: 3/17/19! A.T. Cross GET THE SET! Avitar Pen Set Now $12.99, was $50, with promo code at Cross.com! This offer ends: 3/22/19! A.T. Cross LIMITED TIME OFFER! Get $20 OFF when you spend $100, with promo code at Cross.com! This offer ends: 3/17/19! A.T. Cross LIMITED TIME OFFER! Get Free Engraving on full priced products with promo code at Cross.com! This offer ends: 3/22/19! A.T. Cross GIFT SET! Get Tech3+ Pen, Refill and Clearing Cloth Set Now $49.99, was $89.99, with promo code at Cross.com! This offer ends: 3/15/19! A.T. Cross Get 10% OFF Sitewide and Free Standard Shipping with orders $30+ for President's Week with promo code at Cross.com! Some exclusions may apply. This offer ends: 2/19/19 AT 11:59 PM EST! A.T. Cross GIFT SET! Get Tech3+ Pen, Refill and Clearing Cloth Set Now $49.99, was $89.99, with promo code at Cross.com! This offer ends: 2/28/19 AT 11:59 PM EST. A.T. Cross FREE ENGRAVING! Get free engraving on ALL engravable products with at Cross.com! This offer ends: 2/14/19 AT 11:59 PM EST! A.T. Cross FREE REFILL! Get free refill with any full price, writing instrument, purchase with at Cross.com! This offer ends: 2/14/19 AT 11:59 PM EST. A.T. Cross MLK DAY SALE! Get 45% Off Outlet Plus Free Shipping with at Cross.com! This offer ends: 1/23/19 AT 11:59 PM EST. A.T. Cross LIMITED TIME OFFER! White Tech3+ wuth Refill Set Now $29.99, was $89.99, with promo code! Offer Expires on 1/31! A.T. Cross EXCLUSIVE OFFER! Selected Tech 2 Now $9.99, was $30, with promo code! Offer Expires on 1/31! A.T. Cross EXCLUSIVE OFFER! Avitar Pen Set Now $12.99, was $50, with a promo code. Offer expires on 1/31! A.T. Cross LIMITED TIME OFFER! Star Wars Clicks Now $14.99, was $45, with a promo code. Offer expires on 1/31! A.T. Cross LIMITED TIME OFFER! 35% off All Outlet Products with coupon at Cross.com! This Offer Ends: 1/31/19 AT 11:59 PM EST. A.T. Cross LIMITED TIME OFFER! 55% off All Outlet Products with coupon at Cross.com! This Offer Ends: 1/3/19 AT 11:59 PM EST. A.T. Cross Closeout Offer! Save 70% OFF Marvel Collection with promo code at Cross.com! Offer ends on 11/25 at 11:59 PM EST! Available while supplies last! A.T. Cross EXCLUSIVE OFFER! Spend $100 and get 15% off! Plus, Free Shipping & Personalization with prom code! Some Exclusions May Apply. Offer expires on 12/31/18 at 11:59 PM EST! Cross Marvel Tech2 + Journal Gift Set Featuring Captain America For $75. Cross Avitar Polished Chrome Ballpoint Pen And Pencil Set For $50. Cross 15% Off your order. Cross Sheaffer Prelude Mini Gloss Turquoise Ballpoint Pen For $18.00. Cross Free Shipping on Orders of $90 Or More. Cross $15 Off With Minimum. For over 170 years, A.T. Cross has been home to the highest quality pens and pencils, engraved gifts, padfolios, reading glasses, watches and more. We offer the widest selection of Cross pens, pencils and desk sets available, direct from the A. T. Cross Company. What are you waiting for? Go to cross.com today!